Citation Information: J Clin Invest. 2003;112(11):1603-1618. https://doi.org/10.1172/JCI20401. The anterior pituitary gland integrates the repertoire of hormonal signals controlling thyroid, adrenal, reproductive, and growth functions. The gland responds to complex central and peripheral signals by trophic hormone secretion and by undergoing reversible plastic changes in cell growth leading to hyperplasia, involution, or benign adenomas arising from functional pituitary cells. Discussed herein are the mechanisms underlying hereditary pituitary hypoplasia, reversible pituitary hyperplasia, excess hormone production, and tumor initiation and promotion associated with normal and abnormal pituitary differentiation in health and disease. 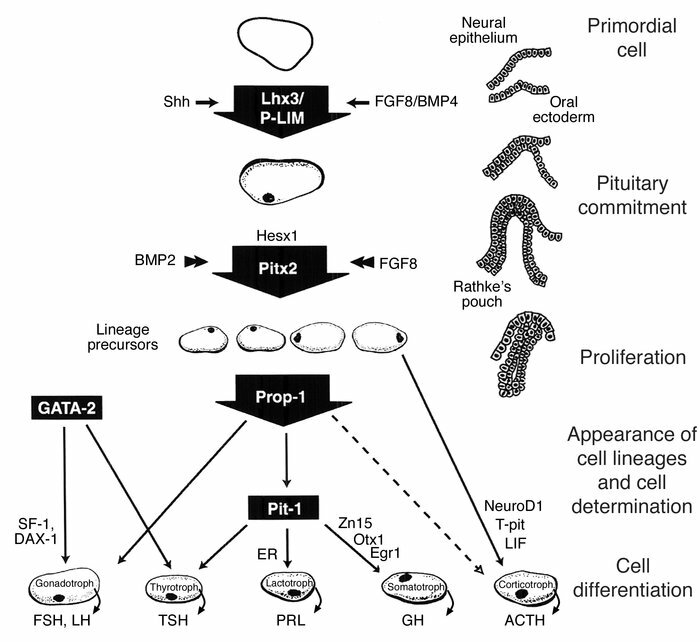 Model for development of human anterior pituitary cell lineage determination by a temporally controlled cascade of transcription factors. Trophic cells are depicted with transcription factors known to determine cell-specific human or murine gene expression. Adapted with permission from W.B. Saunders (139), Humana Press (140), and Karger Publishing (141).